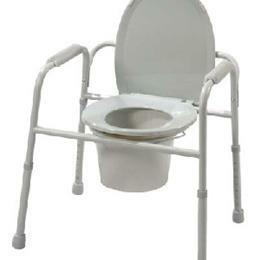 All-in-one commode reduces the number of items carried. Durable plastic snap-on seat with lid. Grey powder coated steel welded construction increases strength and durability. Removable tool free back. Plastic arms for added comfort. Comes complete with a 12 qt. commode bucket with metal handle, cover and splash shield. Limited Lifetime Warranty.